Huawei has teased the release date of Huawei Nova 4 with a poster depicting its upcoming smartphone. Huawei plans to officially release on December 17 in the Chinese city of Changsha. Being a teaser poster, the company has kept all other details of the phone secret. What we have available are rumors and speculations, but the mobile trade is China thrives on such information and most of these turn out to be factual later. The immediate point of interest to note from the poster is the small circular hole on the front display screen that could be housing the selfie camera. The hole is placed on the top left corner of the screen. This design is no different from what is believed to be the Infinity-O design that the South Korean giant Samsung has chosen for its upcoming 2019 flagships, the Samsung Galaxy S10 smartphones. Does it mean Huawei has pipped Samsung to it? One can estimate that the display will not be less than 6 inches going by the current trends in the market, though the exact figure is not known yet. The poster clearly indicates the screen will be practically bezel-free giving the maximum space for the display. 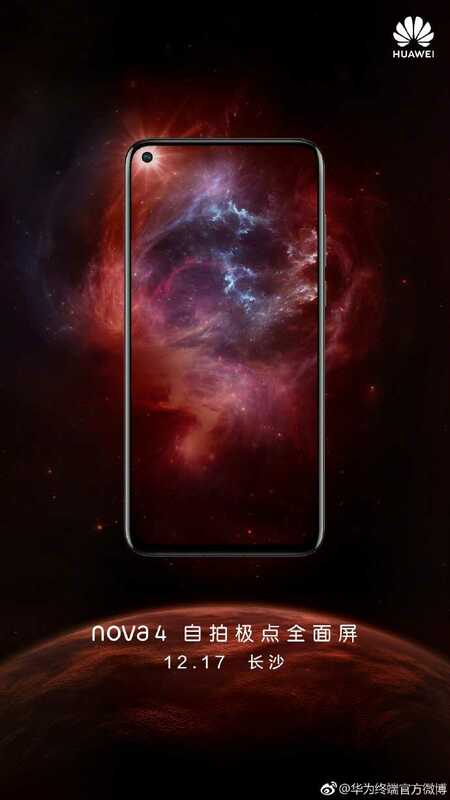 It is not very difficult to conjure up the other key specs either, as the Huawei Nova 4 will be the successor to the Nova 3 and adding the latest improvements, one can say the inhouse Kirin processor, the Kirin 980 and 6 GB of RAM and 128 GB internal storage can also be easily assumed without any hesitation. Similarly, the latest Android OS, Pie, version 9.0 and Huawei’s UI, the EMUI 9.0 as the skin on top of the stock Android too will fall in place. There is a strong sense in the market that the new Huawei Nova 4 will sport dual cameras in the rear as well as the front, although how two sensors can be fitted into the tiny hole seen on the mobile’s poster will remain a mystery till December 17. The few details to be learnt will include the size of the battery; if there is the wireless charging feature and so on. Interest will also lie around the type of unlocking the phone is provided with, fingerprint or facial ID etc. The introduction of the so-called Infinity-O design by Huawei 2-3 months ahead of Samsung will remain the talk of the town for some time.